A magnitude 4.8 earthquake jolted the Turkish resort town of Marmaris in the evening hours of Friday, according to the Disaster and Emergency Management Authority (AFAD). The quake struck at 19:48 p.m. (EET) and was quite deep, measuring at a depth of 61.98 km below the seabed, AFAD said. The epicenter was 11 km south of Lárdos, Greece, the U.S. Geological Survey (USGS) said. No damage or injuries were reported. The temblor was also felt in nearby towns such as Bodrum and Datça. In July, a magnitude 6.7 quake shook beach resorts in Greece and Turkey, killing two tourists who were crushed when a building collapsed on a bar on the Greek island of Kos and injuring nearly 500 others across the Aegean Sea region. In June, a 6.3-magnitude earthquake shook a village on the Greek island of Lesbos, killing a woman and leaving more than 15 injured. 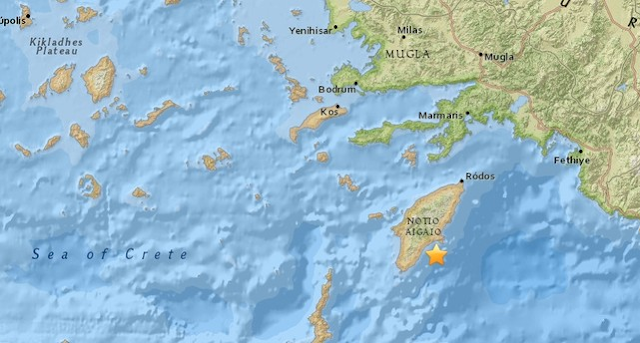 The quake also caused panic on Turkey's Aegean coast. Turkey is among the world's most seismically active countries as it is situated on a number of active fault lines, with the most potentially devastating one being the Northern Anatolia Fault (NAF), where the Anatolian and Eurasian plates meet.